Inc. magazine today ranked Kitware NO. 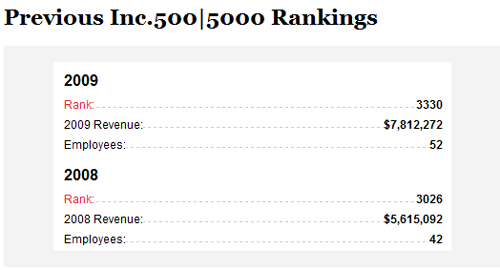 1655 on its fourth annual Inc. 5000, an exclusive ranking of the nation’s fastest-growing private companies. The list represents the most comprehensive look at the most important segment of the economy—America’s independent-minded entrepreneurs. Music website Pandora, convenience store chain 7-Eleven, Brooklyn Brewery, and Radio Flyer, maker of the iconic children’s red wagon, are among the prominent brands featured on this year’s list. Kitware, Inc. is a leader in the creation and support of open- source software and state of the art technology, and is one of the fastest growing software companies in the country. Kitware leverages its open- source communities and diverse technical expertise to provide advanced custom solutions for a host of complex technical problems. Founded in 1998, Kitware’s team is widely recognized for their major contributions to a variety of open-source software systems including the Visualization Tookit (VTK), the Insight Segmentation and Registration Toolkit (ITK), CMake and ParaView. Kitware has made an impact in areas such as visualization, data publishing, medical imaging, quality software process, computer vision, and informatics. Among Kitware’s global customers and collaborators are a variety of academic research facilities, government institutions and private corporations worldwide. Kitware’s products and services include software support, consulting, custom application development, and training and productivity tools that leverage our open- source systems. The 2010 Inc. 5000, unveiled today on Inc.com, serves as a unique illustration of the profound changes taking place in the U.S. economy. Despite the fact that most of this year’s measuring period of 2006-2009 took place during the latest recession, aggregate revenue among the companies on the list actually increased to $321.6 billion, up more than 50 percent from last year. The effects of the recession are seen, however, in the median three-year growth rate, which dropped to 96 percent from last year’s 126 percent. This year’s Inc. 5000 employ a record 1.4 million people, up from one million on last year’s list. With unemployment remaining stubbornly high, policymakers and business leaders will do well to look to the Inc. 5000 companies for fresh ideas on achieving growth and creating jobs. Once again, California tops the Inc. 5000 with the most companies of any state with 684. The Golden State is followed by Texas (404), New York (353), Virginia (293), and Florida (262). All 50 states, plus Washington, D.C., and Puerto Rico, are represented on this year’s list. New York boasts 410 Inc. 5000 companies, making it the top metro area, followed by Washington, D.C. (363), Los Angeles (262), Chicago (203), and Boston (189).